Kastar Ford Ignition Module Wrench is a 25° offset ratcheting dualend wrench containing a 7/32 six-point (5.5mm), and T-20 TORX bit, for easy removal of Ford ignition module without removing or tampering with the distributor. Kastar Ford Ignition Module Wrench . 25 offset ratcheting dualend wrench containing a 7/32 six-point (5.5mm), and T-20 TORX bit. For easy removal of Ford ignition module without removing or tampering with the distributor. Kastar Drain Plug Wrench. Fits 3/8 and 1/2 square female drain plugs. Add a socket to the wrench for use on male six-point drain plugs. Can also be used on serpentine belt tensioners. Kastar Ford Headlight Adjusting Ratcheting Wrench. 4mm x 4.5mm wrench for adjusting headlights on late model Fords with aerodynamic designs and headlights with rear mounted adjusters. 8 length, slim tool profile. Kastar GM Multifunctional Switch Tool. Conveniently remove/install the multifunction switch on GM vehicles . Allows multifunction switch to be removed and installed without removing the air bag, steering wheel, and clock spring. Kastar Cadillac Socket Head Drain Plug Wrench. Single-end, extended 5/16 magnetic bit wrench to accommodate a T-45 TORX bit (included). For use on 2003-04 Cadillac 3.2L CTS, and 1997-2001 Cadillac 3.0L Catera. The FM-720A Kastar Ford Ignition Module Wrench is one of thousands of quality tooling products available from MRO Tools. Please browse Kastar Automotive Wrenches for tools similar to the FM-720A Kastar Ford Ignition Module Wrench. FM-720A Kastar Ford Ignition Module Wrench description summary: Kastar Ford Ignition Module Wrench . 25 offset ratcheting dualend wrench containing a 7/32 six-point (5.5mm), and T-20 TORX bit. For easy removal of Ford ignition module without removing or tampering with the distributor. 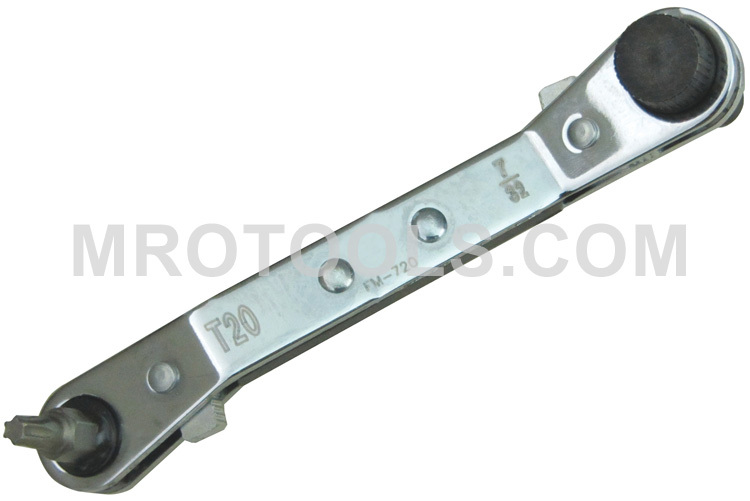 Quantity discounts may be available for the FM-720A Kastar Ford Ignition Module Wrench. Please contact MRO Tools for details.